I am a good example of why encouraging experimentation in different mediums and fields of study is a good idea. For a few years, I took it upon myself to take some poetry workshops to gain more confidence in writing poetry (I am a visual artist who happens to love poetry). One of the prompts in a workshop was to write a poem about your name. This writing prompt unexpectedly brought up an avalanche of childhood memories. In turn, those memories launched a body of work that became the exhibition, Fate and Fortune, which showed at Artspace in 2015. 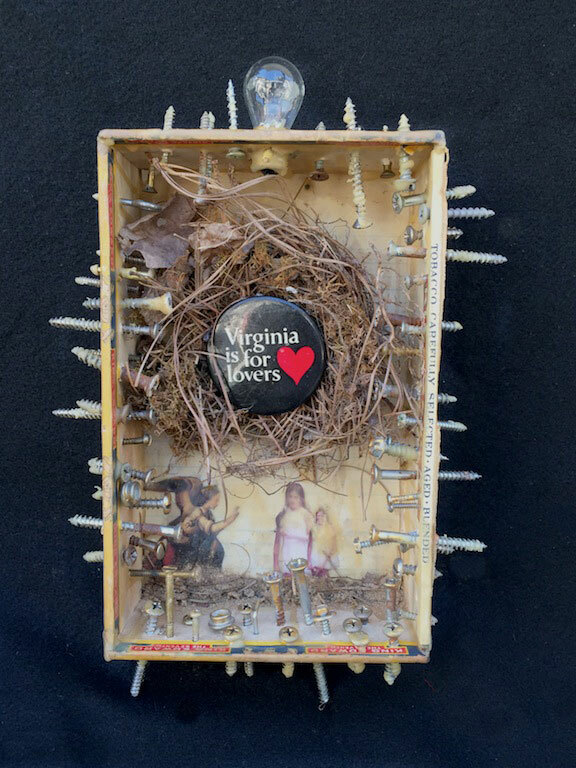 The exhibition contains a series of assemblages (3d mixed media collages) and poems. The Fate and Fortune show will be on display again at Durham’s Golden Belt this September. I believe this exhibition is one of my strongest because of its intensity. The show explores, in part, my childhood struggles with dyslexia and it is the reason why I take my role as a teacher so seriously. There is a poem I want to illustrate to add to the show and I will be working on it this summer. The poem, titled I Told You to Write Your Name, is about a teacher who did not understand a young Jenny Eggleston. Fortunately, most “learning differences” are now caught early and most schools try to quickly educate parents on ways to help kids who struggle academically. But I still hear horror stories of teachers being unsympathetic and at times damaging. I like to think of Egg in Nest Art Studio as a place far away from that kind of stress, a place where kids (and yes, I am including adults) of all ages, personalities and academic levels can come together with the common goal to create art from their own sense of self. I teach anything is possible and that art that is personal is more powerful. It is strangely wonderful and easy for me to have a group of kids or adults working on different projects simultaneously. I feel it is an honor to watch and offer help to emerging artists as they create and experience magical AH HA! moments not only on paper and canvas but in their hearts as well. Check out our Facebook page - Leave us a note, ask a question, start a discussion. Keep Track Of What We Do.